Today, I’m taking you to Sweden to see a beautiful flat with a soothing, neutral palette of whites and wood. Starting with the kitchen, the neutral palette is achieved through the use of plywood. 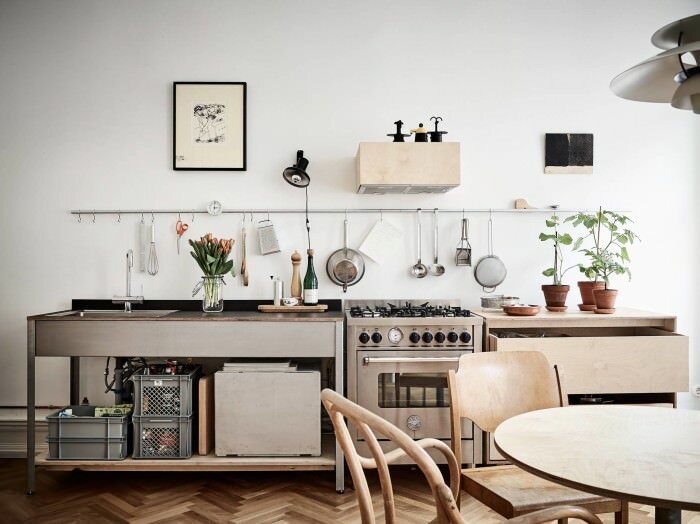 Plywood kitchens are a favourite of mine after white kitchens and the kitchen in this apartment is one that you will want to bookmark for future references. Most the plywood furniture here is custom-made. I really love the discreet kitchen hood and the stand-alone kitchen which somehow, reminds me of Atelier September in Copenhagen. Add a few bistro chairs, a nice table in a light, natural wood to match the colour of the plywood, white walls to bounce back the light and you end up with a very soothing and peaceful space. Plants and flowers are two things that will add a feel-good, homely vibe to the kitchen. I really love the idea of using a large plant like a Monstera Deliciosa or a tall cactus as a design visual statement. We often see plants in nice inspiring workspaces or in the lounge but rarely in the kitchen except for the usual pots of fresh basil, mint and chives which never last very long if you buy them from the supermarket. Storage is key to achieve a minimalist look like these 4 beautiful kitchens but wall-mounted storage adds to the feeling that everything flows nicely around the room. If you’re on a budget, Ikea’s Stuva cupboard has great minimalist lines to achieve a similar look in white. Avoid plastic, first, it’s not good for the planet and it’s ugly! Instead get utility accessories that are so nice that they can be left on display like these Scandinavian wooden brooms by Iris Hantverk or this dustpan and brush from Menu that I love. What do you think of this kitchen? It’s very peaceful and charming, isn’t it!? Simply beautiful. This will be my next kitchen styling for sure. It’s neutral and uses the colour from plants – so I’m bound to like it! I’m actually in the midst of a kitchen renovation so no kitchen until the end of August! It’s definitely inconvenient, but I’m sure it’ll all be worth it in the end. Simple and beautiful Design . thank for sharing. A wonderful pure design, the kitchen is so bright and fresh, also the rest of the appartment is very classy. Yes, this kitchen is very peaceful and charming! It’s perfect to come home to after a hectic day. I really love your suggestion to include plants to create a more welcoming environment. This is gorgeous! I love that you added plants. You can have mint and other herbs in a pot and use them fresh when cooking, plus they all smell heavenly.